So the fateful day has almost arrived! The EU Council will be choosing the new High Representative on Wednesday, July 16. The High Representative position is the Lisbon treaty's successor position to Javier Solana's "High Representative for the Common Foreign and Security Policy." To see why I think this position is so important, see the overview RIGHT HERE. Not to mention this, the past EU High Representative had quite a few very conspicuous and weird 666 connections. To see a summary of those, go to this thread on Fulfilled prophecy.com . Surely, you can find a 666 connection to almost anyone you want to, if you look hard enough. However, the High Representative already did lots of unprecedented things that appeared to fulfill prophecy. It looked like a great theory, all by itself, without the 666 connections. However, his 666 connections were so strong and numerous, that it was hard to believe that they meant nothing. So now, that woman's term is almost up. The EU foreign policy chief has a 5 year term that is renewable once. Ashton didn't want to go for a second term, so she decided to step down at the end of her term. Her term expires in October or December. So they have to pick a replacement before then. Which is why all the heads of the EU countries are meeting on July 16 for a special EU Council Summit to decide the new High Representative, and the new EU Council President. It looked for a while that the strongest candidate for the job was Radek Sikorski. If we think the Antichrist will someday hold the office of the high representative, he was the best candidate their was. He was also the strongest candidate in the EU. Here is a previous blog post on why I think so. He is very hawkish, wants to split EU and US defense alliances, is very outspoken against Russia, and wants to revitalize the 7 year European Neighborhood Policy. He also wants the EU to become a "superstate." But he recently got caught in a scandal saying that his ties with the U.S. were "worthless." He also said some bad things about David Cameron. So a lot of analysts say that this really hurt his chances at becoming the next high rep. What is more, lots of think tanks and analysts are saying that the ENP is broken, and needs fixed by a new strong High Representative. But it appears to be "business as usual" as one article said. When choosing the high rep, the heads of states are more worried about "ticking all the boxes." For example, the new commission president is a man, from Luxembourg, and part of the EPP party. Well, that means that the other jobs have to given to someone who is not a man, or EPP, and perhaps from a different region in the EU. This article on Europe Decides shows the incredible balancing act that the outgoing EU council president must perform in order to please everyone. He has to balance political party, gender balance, North-South balance, and so forth. This is likely why the Italian foreign minister is the front runner to become the next EU foreign policy chief. She barely has any experience. But keep in mind, this didn't stop them from nominating Catherine Ashton as the last high rep. All the think tanks keep prodding the EU to actually choose a strong person, and get its foreign policy pulled together. But all of these cries are falling on deaf ears. They are more worried about ticking all the boxes than say, job experience, in a position that pays more than President Obama. Please don't be confused! I have no problem with women holding political office! What is frustrating is that she can't be the Antichrist. And we might get two people in a row that are just non-starters. Yes, emotionally this was/is pretty upsetting. I was very discouraged when I learned that they would likely choose Mogherini for the job instead of someone who could be the Antichrist. However, Sikorski and Lajkak are still potential nominees. If you want to go to the Europe Decides website, there is a great article there about the "rubik's cube" that Herman Van Rompuy has to solve to please everyone and tick all the boxes. 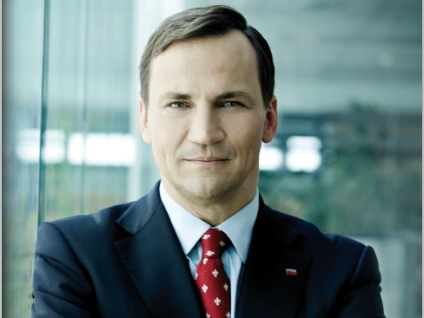 Sikorski is still a possible combination. Who knows what they will decide. Perhaps they will choose Sikorski, perhaps Mogherini, perhaps the Bulgarian woman (also high on the list). But as frustrating as this would be emotionally, the theory remains untouched logically. There is nothing at all about having the next high representative be a woman that would destroy the theory or hurt it in any way. At least, it won't be hurt any worse than it was in 2010, when Javier Solana was not the man we thought he was. The EU theory is a relatively simple theory. It explains all of the facts decently well. And all those facts are "pulled together" by one thing...the EU. The EU "unifies" lots of different facts about prophecy in a relatively simple way without too much forcing. A high representative, whose job it is to be the person who carries out the "common purpose"
What is the chances that NONE of these things mean what we think it means? What is the chances that they are all wrong?!? If they nominate a woman, all that means is the Antichrist hasn't come yet, no more, no less. I have a hard time believing that the 666 connections don't mean anything at all. And prophetically, the High Representative does fit best to be the Antichrist, as far as I can tell. They are the person designated to fulfill the EU's "common purpose" (i.e. common foreign and security policy). And the new commission president doesn't really strike me as the Antichrist type. All the analysts are whining about how weak this current ENP is. But we know in the Bible that the 7 year covenant will be a "strong" covenant. This last one was very weak, and the current one doesn't look much better. It has hardly stopped the Arab Spring or prevented any of the political disasters we have seen today. The next ENP cycle is in 2020-2027. The next high representative will be nominated about one year before that begins (around 2019). So that would be a very fitting time for the Antichrist to come to the scene. He could ascend to power, then make a brand new 7 year covenant that actually has strength to it. Russia tensions could be getting worse, so there will be increasing frustration if the next EU foreign policy chief (2015-2019) does a bad job. There could be increasing fears about what to do with Russia. Furthermore, Britain will become even more keen on exiting (around 2017), since nothing is really changing. Other states could be interested in exiting as well. It also gives time to rebuild the Jewish temple. Scenario 1: A woman is chosen for the top job. She is not the Antichrist. We have to wait longer. Scenario 2: A man is chosen for High rep, but doesn't turn out to be the Antichrist. Same as scenario 1. Scenario 3: They nominate a man who could be the Antichrist. He serves 5 years, then gets reelected for another 5 years, terminating his job around 2024 (close to the midpoint of the 2020 cycle). Scenario 4: They nominate a man who could be the Antichrist. He does what the influential Carnegie Think tanks want him to do, and "reboots" the ENP in 2015. Scenario 5: God surprises us, doing something totally different. His perogative. I will be praying a lot this week. I pray that we won't be made to wait again. But as others have told me, it is indeed up to him. Actually all this is to me is a smokescreen. The right crisis can put the "right man" in there in a heartbeat. The devil is very crafty at all this and remember the man of sin is revealed--so not necessarily elected perhaps? Solana is now 72. Those are significant numbers and perhaps by the time he is 73, maybe he will be assuming that role...? 7 and 3 are highly important numbers in the Bible that speak to a completion of something. Maybe then he will reach his "prime"? All I know is you can't count him out (not quite yet) because even though Ashton has been the "face" of that position, he still pulls strings in a behind the scenes capacity and it is as though he is hidden in plain sight. Who knows exactly what may make him or another surface to take that role, but truly I do not think the wait is years out. I think it is much sooner than that.